Yesterday I spent pretty-much all of the daylight hours on the patch and what splendid daylight hours they were. Warm and sunny with light variable winds, it may have touched 20 degrees in the afternoon. We were ringing for most of the day and it was so warm I was in a T-shirt for much of the afternoon...in November. It was soon apparent that the influx of thrushes had quickly passed inland, no redwings or fieldfares to be seen. There were plenty of blackbirds and we ringed a single song thrush. Most of the blackbirds were continental birds, the adult females a nice grey colour and many with longer wings than our resident birds. Some of the blackbirds were carrying a lot of fat - they were on the move. As well as blackbirds we caught a lot of goldfinches and siskins which are taking advantage the abundance of seeds this year. The siskins are especially liking the alder cones. 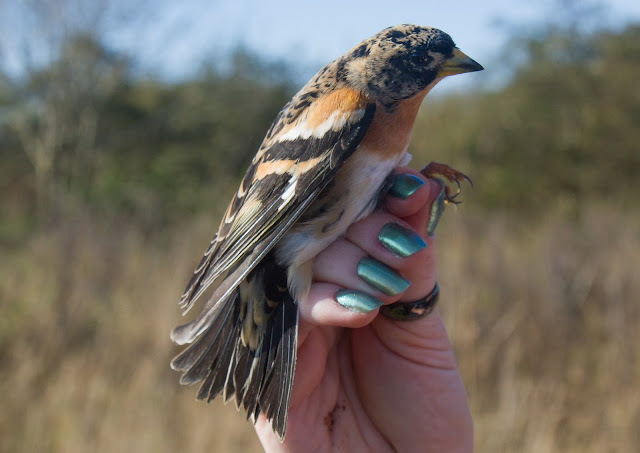 We caught a single brambling, a nice first-year male. 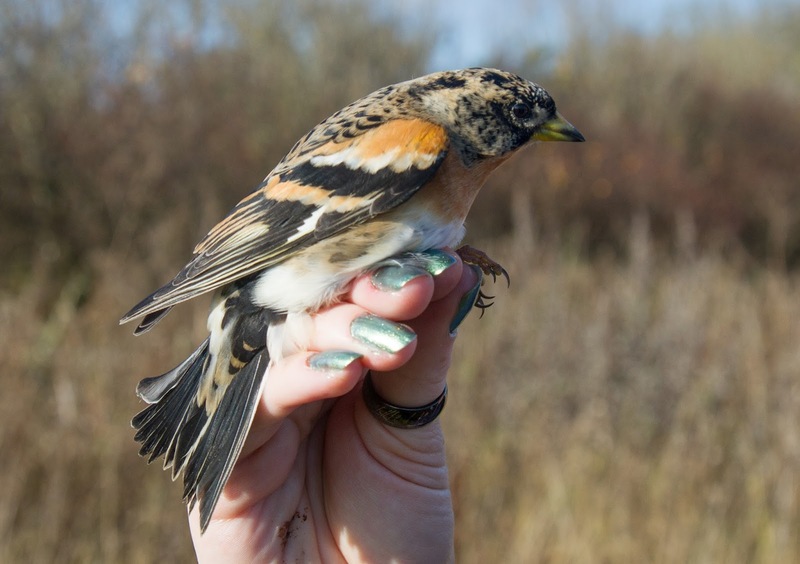 This is the first brambling we have caught since 2006 at Druridge. We caught 95 birds of 17 species by the end of the day. 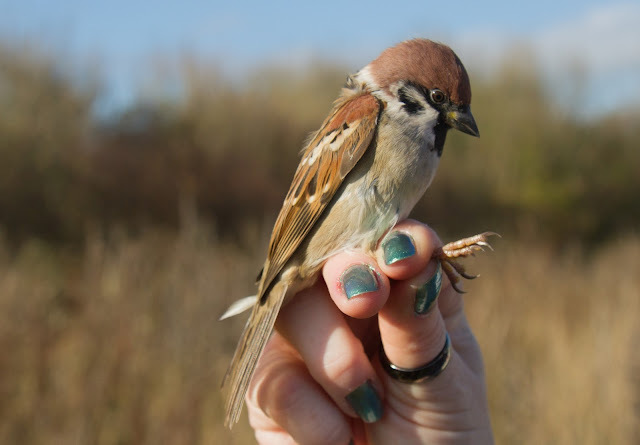 The increase in the population of tree sparrows in the area around Druridge and generally in Northumberland means we are catching more of these beautiful birds. Also of note was a late chiffchaff, not a 'sibe' this one, a typical yellowy-green collybita. It was also carrying a lot of fat, it weighed over 11g. We also caught a female chaffinch that we ringed way back in August 2009 in its first year, odd that we haven't caught between then and now. Six and-a-bit is a good age for a chaffinch. Early in the morning we watched a short-eared owl being mobbed by passerines over the Budge fields. In the afternoon a peregrine passed through and a large female sparrowhawk was seen chasing blackbirds through the bushes. A brief seawatch after the nets had been put away produced two drake velvet scoter on the sea and a handful of red-throated divers. I was talking to a guy last week from down south while away about Tree Sparrows and saying how well they were doing up here. 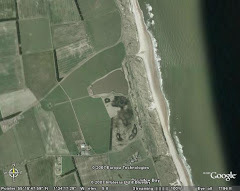 I mentioned that not that long ago (10 years) there was only the one definite site to see them , at Big Waters, but gradually more individual sites had appeared and some in Druridge Bay had "linked up". Love the header btw.....the owls eyes are awesome. Cheers john. We get tree sparrows in our garden everyday now and I wonder if this adaption to using feeding stations in gardens could be part of their recent success? Thanks for header suggestion, I tried to get the text colour to match those eyes. Microsoft can't come close to nature!